With all the dietary advice out there today, how can you know what is right for your body? 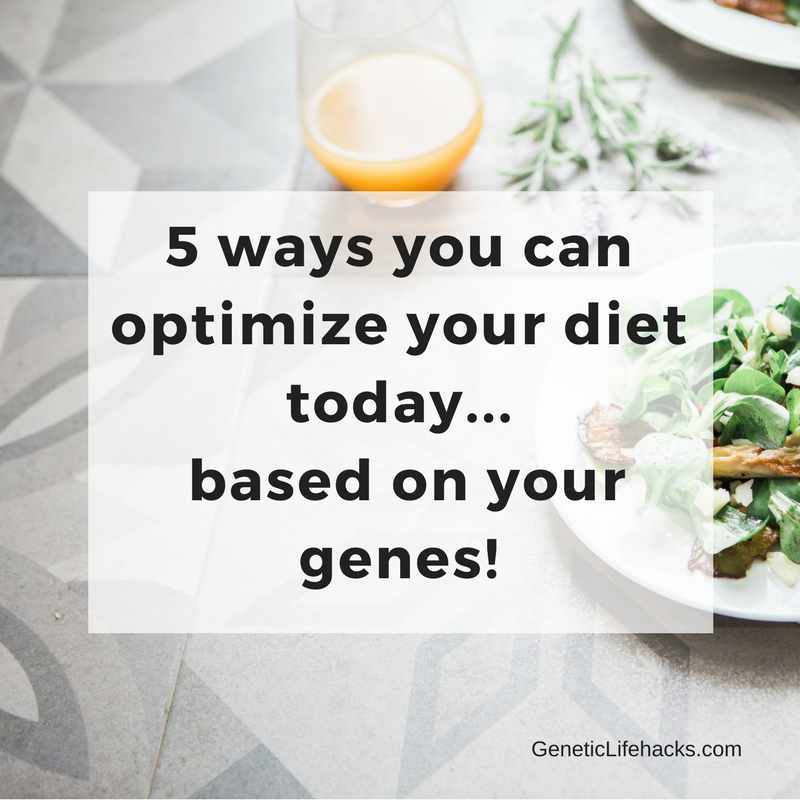 I’ve boiled down 5 quick ways that you can use your genetic data (23andMe, AncestryDNA, etc) to optimize your diet to fit your genes. #1) Are you genetically lactose intolerant? Lactase is the enzyme that breaks down the sugar, lactose, that is found in milk products. While most people of European Caucasian ancestry produce lactase as an adult, about 10% of that population doesn’t produce lactase. For people of other ancestries, the majority do not produce lactase as adults. Lifehack: If you don’t produce lactase as an adult, you are relying on your gut microbiome to break down the lactose in milk. Drinking less milk at one time, switching to lactose-free milk, or boosting your gut microbiome with some lactose-digesting probiotics are all options for those without the ability to produce lactase. Read more about the genetics of lactose intolerance. #2) Are fruits and vegetables giving you enough vitamin A? Beta-carotene, which makes carrots and sweet potatoes orange, is often considered to be a great source of vitamin A. But some people are much better at converting beta-carotene into vitamin A than others. A deficiency in vitamin A can cause skin issues (dry scaly skin, acne, keratosis pilaris, cracked lips) and eye issues (dry eyes, problems with night vision). There are two main genetic variants to check in the BCMO1 gene to see how well you convert beta-carotene. Lifehacks: If you have a “T” in both of the SNP’s above, your beta-carotene conversion is almost 70% less than normal. A “T” in just one SNP from above decreases your conversion by about 32%. [study] Eating liver is a great way to get the retinol form of vitamin A that your body needs. Can’t stomach liver? A vitamin A supplement that includes retinol palmitate may work for you. You don’t want to go too far overboard with supplementing with vitamin A since it does get stored by the body. Read more about vitamin A and your genes. #3) Is saturated fat increasing your risk of high blood pressure? A recent study looked at the influence of a higher fat diet (mainly from saturated fat) on blood pressure. The study found that the higher saturated fat diet caused higher blood pressure only in those with a genetic variant known as A/CE deletion. Lifehacks: This is definitely a case where if you have the A/CE deletion and higher blood pressure, you should experiment with reducing saturated fat and see if your blood pressure comes down. The study showed approx. a 10 point average difference in systolic blood pressure for those with the A/CE deletion and high-fat diet. Read more about the interaction between high-fat diet, blood pressure, and your genes. #4) Will drinking coffee in the morning decrease your risk of heart attack? Coffee is the number one source of antioxidants in the US diet. Our ability to metabolize the caffeine in coffee varies quite a bit according to our genes. About half of Caucasian populations are fast metabolizers of coffee, with the other half being slower metabolizers. Lifehacks: Common sense dictates if you have a family history of heart disease and slow caffeine metabolism genes, you should consider keeping your coffee consumption at 2 or fewer cups of coffee on an average daily basis. Alternatively, if you are a fast metabolizer of caffeine you can reduce the risk of heart attack with 3 cups of coffee a day. The study also showed that for those younger than age 59 who were fast metabolizers of caffeine, drinking 4+ cups a day also decreased the risk of heart attack. Try Bulletproof coffee with Brain Octane oil. Roast your own green coffee beans. It is fairly easy to do, and the taste of fresh roasted coffee is outstanding. You can use an air popper or simply a skillet on a propane burner (outside, ’cause it is a bit smoky to roast it). A study came out recently showing that both low carb and low-fat diets were equally effective for weight loss. There are other studies showing differences in dieting results of low carb or low fat that depend in part on genetic variants. Looking at your genes may give you an idea of which diet would work best for you. Amylase is the enzyme that digests of carbs, starting in your mouth. A genetic variant in the amylase gene (AMY1-AMY2) predicts whether you are likely to produce a lot of the enzyme or less of the enzyme to break down carbs. Your genes also play a role in how carbohydrates are likely to affect your blood glucose levels. Lifehacks: If you are a lower amylase producer but want to try a higher carb / lower fat diet, you can supplement with the amylase enzyme. I recommend actually testing your blood glucose levels to see how you react to different foods/meals. Blood glucose testing kits are not all that expensive and will give you a way to quantify and keep track of your response. Read more about amylase genes and carb metabolism and blood glucose genes. I hope you have found something here that is useful. Personally, I’m often frustrated by the one-size-fits-all approach that so many health and wellness websites proclaim. While I didn’t have huge health problems, the little diet adjustments based on my genes have made a noticeable difference for me. For example, figuring out that I don’t convert beta-carotene to vitamin A lead me to try a supplement of the retinol form of vitamin A. A month later I noticed that I didn’t have the little bumps (keratosis pilaris) on the back of my arms that had been there since childhood. (And yes, I did test it out to make sure it was the vitamin A by stopping the supplement for a month, at which point the bumps came back.) While getting rid of bumpy skin isn’t earthshattering, all the little tweaks to my diet and lifestyle based on what I’ve learned from my genes have added up to me being healthier and mentally sharper. Just wanted to say how much I appreciate these posts. Apparently my body doesn’t know what to do with carrots either. I adore liver, but I’ll look into eco-friendlier alternatives (maybe just take a supplement). Also I’m AA for coffee and already take 2~3 cups per day. It’s nice to have an excuse to justify it. I think it has been mentioned before, but it seems that our bodies are clever. In our family I for ages have actually craved liver (weird, I know), and then just recently discoverd like melboiko that I don’t know what to do with carrots. Great stuff Debbie. Debbie Moon, thanks so much for the post.Really thank you! Keep writing. Hmm, I produce less amylase, have better glucose levels on a high fat diet yet at less risk of T2 diabetes on a lower fat diet. Ouch.